Listing Information Courtesy of: Fred Miller Group, Inc. 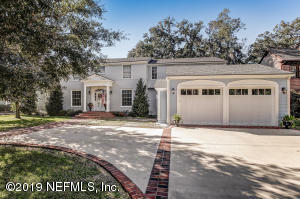 Elegant Ortega home exceptional amenities on large corner lot! 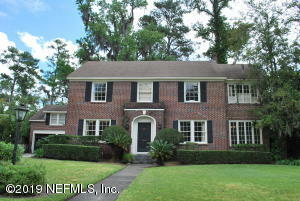 Beautiful hardwoodfloors & plenty or natural light flow throughout the home's open, airy layout. Generously sized living & separate dining room both with fireplaces. French doors that lead to the well-manicured backyard. Spacious island kitchen featuring marble counter tops, gas cook top, double oven & inviting breakfast nook. 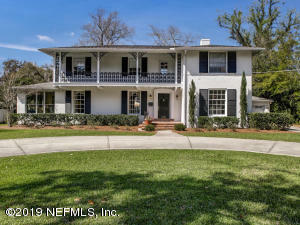 This home was remodeled in 2005 with a new master BR, bath & closets + fabulous den with built-ins, new powder room bath, laundry & office. Additional recent upgrades include: Roof (6 years), HVACs (3 years). encapsulated ''Clean Space'' under house with new dehumidifier. Two-car garage with workbench. 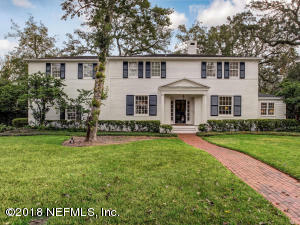 Call today to arrange your private showing of this stately home. 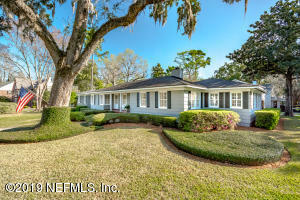 This comfortably elegant home sits on a fully fenced, maturely landscaped lot with an enviable 3 car garage. 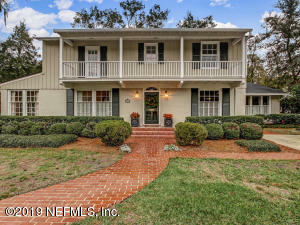 This 4 bedroom 3.5 bath home has the perfect combination of formal and casual spaces with an easy flow throughout the rooms for entertaining. Beautiful hardwood floors, updated kitchen and baths, new Marvin Clad Ultimate Low-E windows, crawlspace dehumidifier and liner, make this home truly move-in ready. The screened porch is where you will want to spend time curled up with a book or hanging out with friends. The cozy family room has built-in bookshelves, a vaulted ceiling and inviting fireplace and a home office is ready for you to get down to business! Too many upgrades to list, just come see it!! Nestled in the heart of Ortega Terrace, this home is filled with memories of children growing up enjoying each and every space. 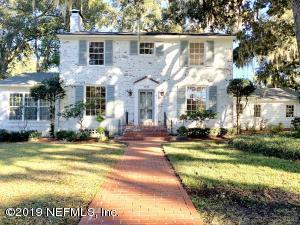 It is now time to pass this beautiful traditional home to it's next owner. Ride your bikes down the quiet tree-lined streets or head to the park! Plenty of bedrooms and bathrooms here and a backyard for miles! Come see all this Ortega house has to offer! 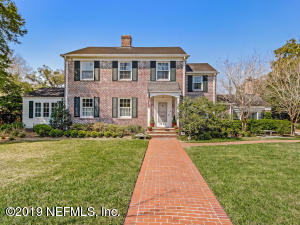 Classic Ortega painted brick two-story prominently located on one of the finest corner lots in Ortega Terrace! Home offers both formal and casual gathering spaces. Enter home via welcoming foyer flanked by living room with fireplace and sun room / office to your right and formal dining room to your left. Kitchen offers prep island, dining space for 6 and is adjacent to spacious family room that features wood burning fireplace, custom built-in shelving & full bath. Kitchen also opens onto lovely two-tiered patio that features an outdoor wood burning fireplace. 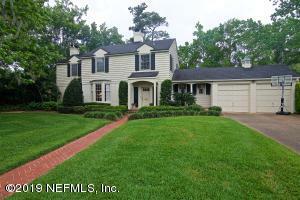 Upstairs offers large master suite plus 3 additional bedrooms & guest bath. Additional features include detached 2 car garage with workshop, recreation room (not included in square footage) and a private back yard! Location, Location! In sought after Ortega Terrace. This home awaits your personal touch. GOOD BONES! Upgrades will bring this classic Georgian brick back to its intended beauty. Original wood floors, high ceilings, crown molding. Sweeping graceful staircase to 2nd floor. TWO Light filled sun porches off LR and Master. Formal LR room w/marble fireplace. Knotty pine Paneled den w/Stone FP and bay window to the Open Patio & very large backyard w/plenty of room to add a pool, summer kitchen or gazebo. Lots of possibilities here, bring your contractor! Separate bonus BR/bath above the garage, great for teen, Au pair or guests. 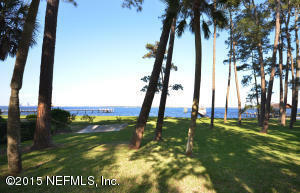 Near area schools, Churches, NAS JAX,, golf, Shopping, minutes to downtown Jacksonville, the St. Johns River and airport.